Celery~ sometimes used in salad, dip in peanut butter sinful... but nice , or crunch away as snacks. Many times... 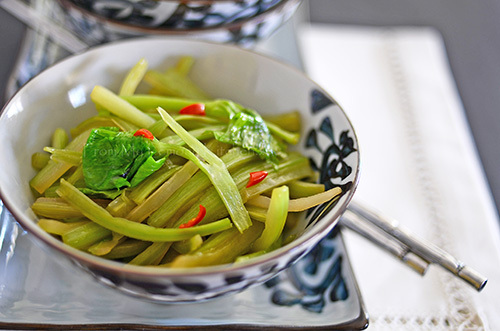 I would flipped over the pages of my Japanese cookbook, looking for some mouth watering Japanese dishes to cook and of course to blog about ... and many times this Spicy Celery Stir-fry page would 'stare up' at me... and again... on numerous occassion... I would just turn the pages over ~ giving it a miss. Note : if bird's eye chilli is too hot to handle... use dried chilli instead!! Cut celery into 2 inches long strips. Heat oil in the wok or frying pan. Add chilli, sugar and celery. Stirfry over moderate heat for 1 minute. Add soy sauce and continue to stir for another 1 minute. Add the celery leaves and continue to stir. To keep the celery crisp, continue to cook for another 3 minutes. 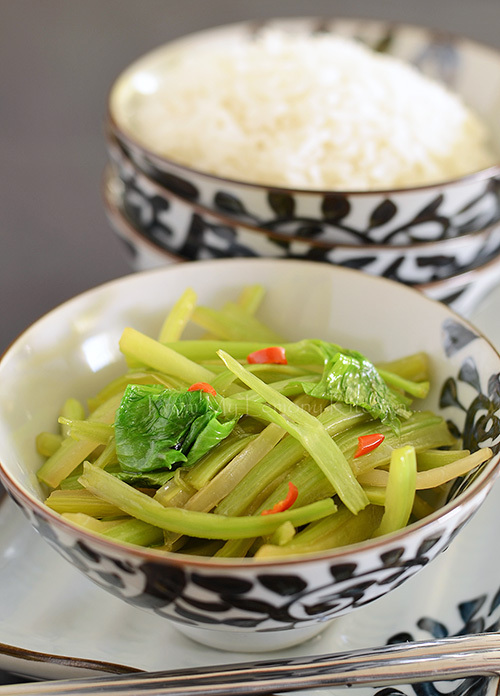 Serve as side dish with steam rice. In fact, this is a very simple recipe and look so good. I must try this one day. Love this simple stir-fry dish. So flavourful and healthy! Celery is not my thing, but this recipe sparks my curiosity! Thanks for sharing. I actually like stir-fry celery, esp. that celery crunch!